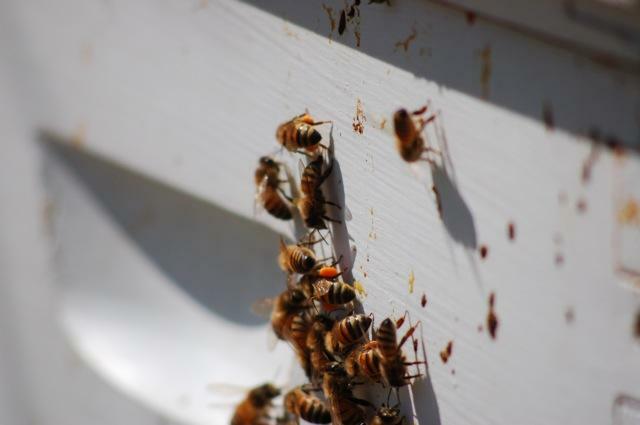 Per discussion in the February Meeting, this blog category will allow our members to post when they see their first honey flow, what area are the bees in, and what major nectar sources are in bloom at that time. Later, we can accumulate comments from the web site as well as club members log information to come up with an idea of when the honey flow starts and stops in each area. These are Don Sargent’s bees outside of Whitewood on Easter Sunday. They are bringing in bright orange pollen and some cream colored pollen. The Bees did not rest on their Easter Sunday. This entry was posted in Honey Flow. Bookmark the permalink. Pollen sources in the Badlands have been accessible for about 2-3 weeks now. Bees are bringing in light yellow and dark orange pollen. Dark orange is attributed to Dandelions, which we have a lot of … don’t cut the grass too short 🙂 I think we have yellow sweet clover (haven’t positively identified it yet), also Hood’s Phlox, Threadleaf Musineon and Desert Biscuitroot (both Natives in the carrot family, but often referred to as wild parsley, the flowers look very much like Yellow Wild Buckwheat which is said to be excellent for honey production), Blue Mustard (non-Native from Asia), Plains Cottonwood is flowering, as well as a few others not ID’d yet. I’ve recently planted an American Linden (Native in US but not necessarily here) which is known as a “bee tree”. I’m also planting Hansen hedge roses, Caroline raspberry, Eastern Red Cedar, Rocky Mountain Juniper, and various Native grasses and perennials. Last year I planted a Green Ash and Hackberry. I plan to use bee-friendly NOLO Bait or Semaspore as soon as I see the first grasshopper! – to save the plants for the bees. Happy Spring everyone. It’s Sunday, March 20, 2011, a beautiful first day of spring. I put out a second quart of syrup for the bees yesterday–they’ve been out and about on warm days the last couple of weeks and have already consumed one quart. This afternoon I noticed that they’re bringing in pollen. Not sure of the source. It’s a dull gold color. The bees appear healthy and are very active. About a month ago, I sprinkled sugar on the top inner cover of the hive. Most of it is still there but it looks as if the bees have been working on it. We live near St. Martin Monastery about a mile off Sturgis Road, just outside the city limits.